Full disclosure #1: Ms. Leighton-Porter is a fellow BookElf author. That certainly inspired me to read her book, and may have influenced the following review. I believe the review to be fair and honest in any case. Publisher: Mauve Square Publishing, 2012. 232 pages in paperback (I bought the Kindle version). Ten-year-old twins Joe and Jemima Lancelot have lost their parents. They aren't dead, just missing. The twins stumble into a clue in the form of a very old book, and find themselves...in Atlantis. 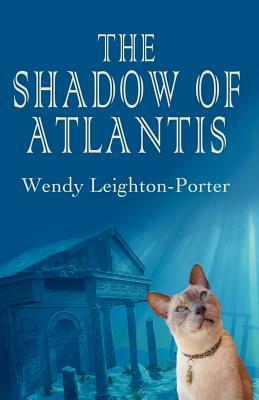 Now they not only need to find clues as to where their parents have gone, but save the people of Atlantis from the coming disaster that will make their city vanish forever. With the help of Max, their Tonkinese cat (though really Max is his own cat, and they are probably his people), and Charlie, the neighbor boy, they tackle all the challenges the book throws at them. I have to start by getting one thing out of the way: yes, the premise of the book is a bit reminiscent of the Magic Treehouse books. I mean, a magic book that takes the children off to places far distant in time and space has been done before. But it hasn't been done like this. Maybe it's Max that makes the story so much more interesting for me (well, and the fact that this book is middle grade fiction, not an easy reader). I'm not a big fan of talking animals (actually, given my fondness for Redwall, the Princelings, and Narnia, I guess I am. Just not mixed up with humans). But Max is a real personality, and adds a lot to the story. He provides a bit of something almost adult, but not quite, allowing the children to continue to get into situations that parents wouldn't allow. The action is quick, the writing solid, and the characters well developed. The children might have had a little more luck talking to adults in Atlantis than is realistic, but that is compensated by the standard density of the adults back home in England. And the book uses a great method for creating the kids-without-parents trope that is definitely useful in children's adventure books: the children are out to rescue the parents, who have made a very bad (and foolish) blunder. I like that table-turning, and wish the children luck in tracking down their wayward parents (because, after all, this is only the beginning of a series...). It is also fairly clear that the series is going to make good use of history, without the story ever getting bogged down in travel-guide style narration. I'm all in favor of that! Best age range is probably 8-10. The children face peril, but there is no violence, and nothing truly scary. The writing is pretty accessible for younger readers, I think, and the story line a little simpler than books aimed at the 10-12 set. Older children may enjoy it however, especially if they have an interest in places like Atlantis, and younger children might find it a great next step after the Magic Treehouse. And anyone who likes to contemplate time travel will enjoy that aspect of the story. Full Disclosure #2: I bought The Shadow of Atlantis with my own money and received nothing from the writer or publisher in exchange for my honest review. The opinions expressed are my own and those of no one else. I am disclosing this in accordance with the Federal Trade Commission's 16 CFR, Part 255: "Guides Concerning the Use of Endorsements and Testimonials in Advertising." I've finished number 6. It's very useful to get your age-range guidance, since it helps me work out how to write for the age group myself! I hope I have some idea what I'm talking about! More than me, that's for sure! Thanks for reviewing this book, it sounds like one my 9-yr-old would like. I hopped over from the Kid Lit Blog Hop.